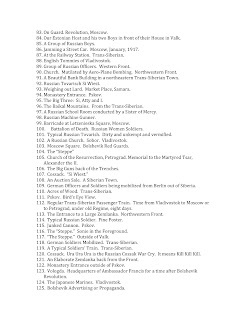 In response to the interest that was expressed about the WWI images from France, which I recently found in a camera bought at an antique store, I decided to write up a story of how I found a much larger collection from the same time period taken in Russia, China and Japan. In 2005 I was asked to come by a Northern California home to help translate and identify some mystery images. I love old photos, so I was eager to help. All I knew when I was on my way up there was that they were from Russia and really old. When I arrived at the house in Northern California I saw in front of me a number of very old wooden storage boxes and one more much larger black carrying case. The owner told me that inside were pictures taken by her grandfather. She opened one of the boxes and pulled out a glass slide about 3x4in. I must admit I did not know the term 'Magic Lantern Slide' back then and did not immediately realize what I'm looking at. But there were hundreds of images from snow-covered villages, train tracks, bullet-riddled buildings, soldiers in trenches, soldiers by houses, soldiers on trains.... Lots of soldiers. There were also lots of pictures from China and Japan mixed in among them. The slides were also exquisitely colored by hand and the colors have been preserved wonderfully. I finally tore myself away from the images to ask what I was looking at. The name of the photographer was John Wells Rahill, a pastor who graduated from Yale University in 1906. 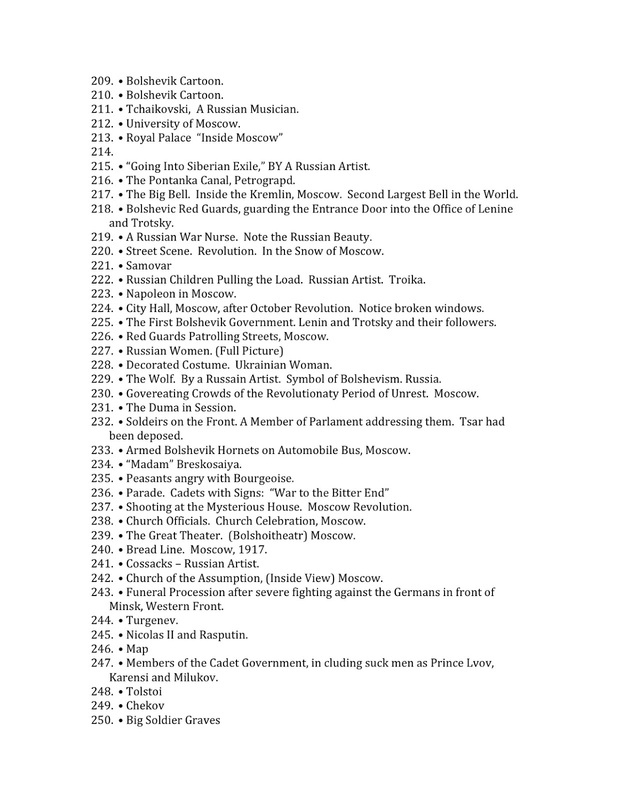 He had a strong interest in Russian history and culture. His topic of study at Yale, as mentioned in a small article about his graduation, was "Contribution of Christianity to Socialism". As it so happens John was also an avid photographer and used a Kodak Jr. #1 roll film camera. In the winter of 1917 John heard about the first Russian revolution and was determined to go to that far-off land and experience the changes for himself. In the summer of 1917 John joined the American branch of the YMCA, in particular the War Works Division. During the first World War YMCA was vary active behind the scenes helping the armies of both sides in that terrible conflict by providing things like rest and relaxation activities, overseeing troop repatriation and other logistics. 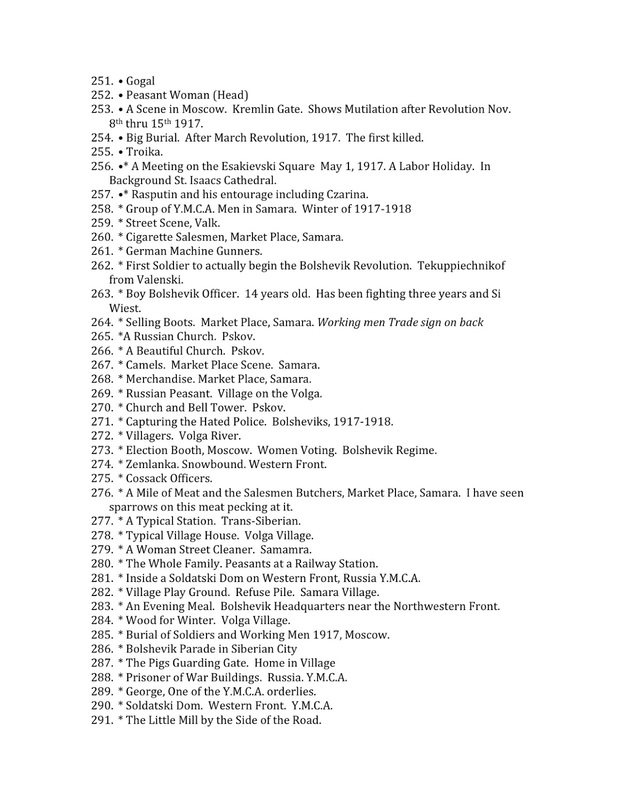 On the service card, which I was able to locate at the YMCA Kautz Family archives in Minneapolis, the date of his departure for Russia is stated as October 7th 1917 - the very same day of the big final push in the Communist Revolution. 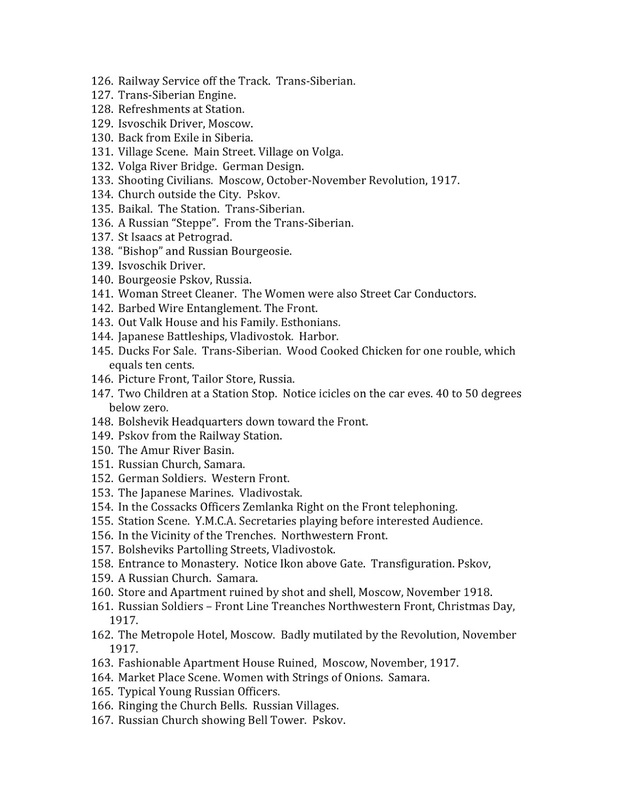 He was sent to work with the troops of the Western Front of Russia. He set up a facility the YMCA called 'Soldiers House' in the back of the front lines in a village (now a small town) of Valk. Today the town carries the name Valga and lies split in half by the border of Estonia and Latvia. There he was given an old school building inside of which he arranged for a reading room, game room, kitchen and other facilities to help the soldiers during their time away from the fighting. John spent only a few months working in Valk when the turmoil of the revolution and the conflict with the new government has forced the removal of most of YMCA staff from Russia. 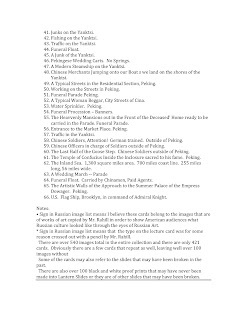 It is known that due to heavy fighting in Europe it was deemed that the safest route for their evacuation was determined as being via Trans-Siberian and then through China and Japan. John returned to the United States in the spring of 1918. All along during his fascinating trip he took plenty of photographs with his trusty Kodak. Upon his return John had the best of his images converted into Magic Lantern Slides because he was interested in sharing his experience and the plight of the Russian people with the world. 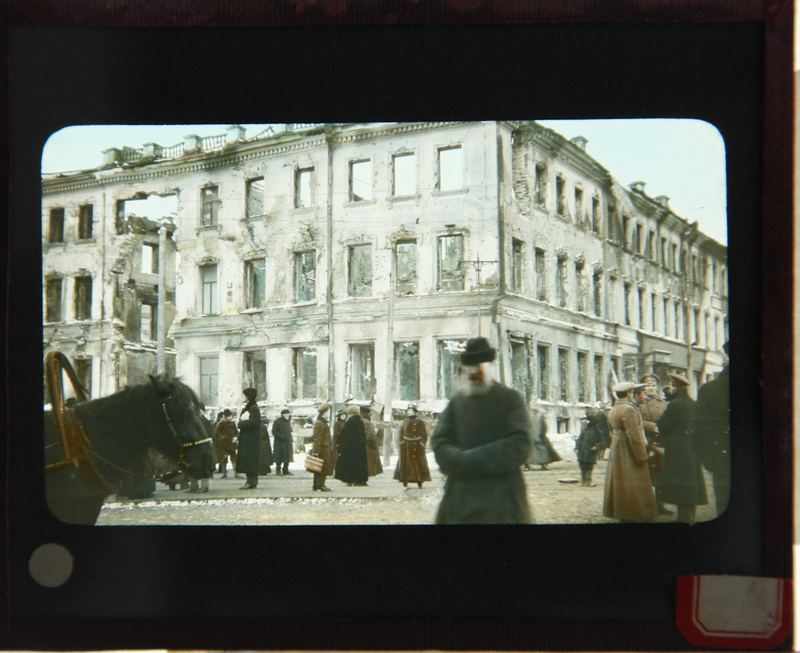 As it so happens he also visited Moscow and there purchased more than 50 slides there from a professional studio. He even had the idea of finding the same buildings that were featured in those slides and re-photographing them himself. He also bought some professional slides in Japan and again went to the same places and made his own exposures there. Upon his return John began a long career as a pastor and was known to give lectures on the work of the YMCA during the First World War. 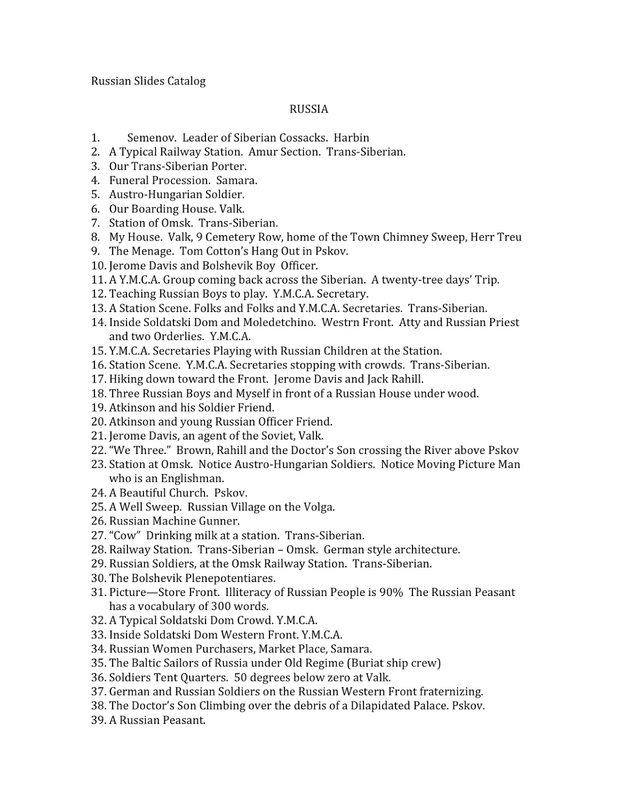 It appears that those who worked in Russia were soon blacklisted and labeled as 'socialist sympathizers'. So by the middle of 1920s John packed his collection of over 500 glass slides along with the black and white proof prints, lecture cards and the slide projector into a metal chest in the basement of his house. And so the first part of the life of this incredible collection came to an end. It was not until the passing of his daughter that the contents of that chest were found by his granddaughter. After I saw those images in 2005 I became very intrigued by them and wanted to see them preserved well and presented to the world. Six years passed and in 2011 I purchased the slides. Here you can see the short video about the collection, which I made after doing some preservation work. 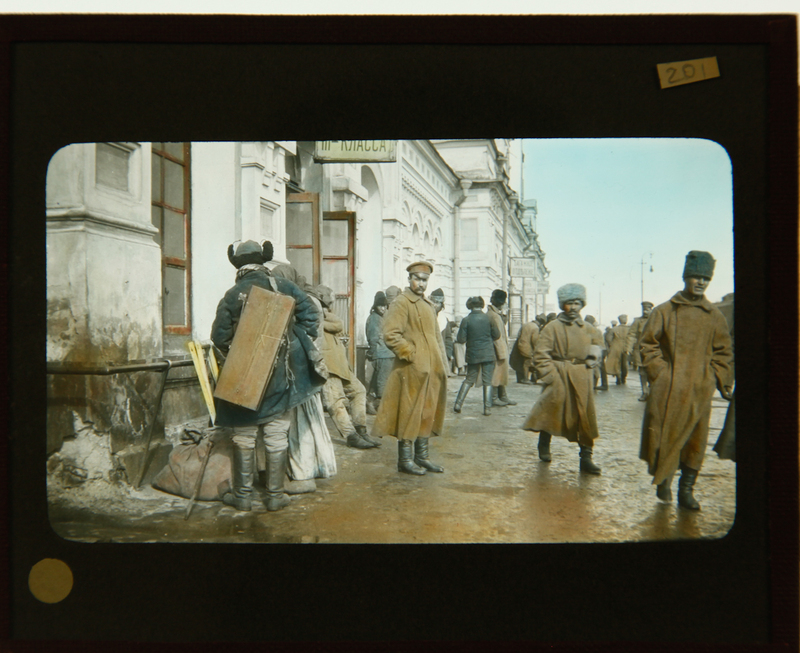 My goal now is to go back to Russia in 2017 and travel along the path taken by John to re-photograph the same locations 100 years after him and make a new set of Magic Lantern slides to be preserved for posterity. I am open to funding proposals. 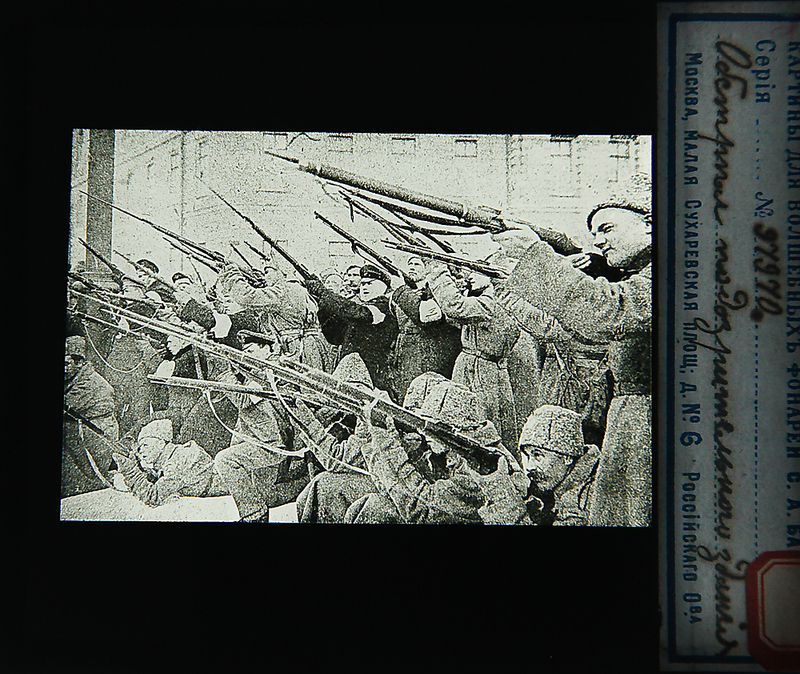 Some readers may ask why would I want to make lantern slides, so I feel compelled to explain my reasoning. I have a deep love toward analog photography and historic authenticity of images as artifacts. When properly exectuted, gelatin silver images printed on glass plates are extremely stable and that is evidenced by the remarkable condition of this 100 year old collection. I believe that with good care they will be viewable in another tow hundred years. I am also inspired by the compelling beauty of a projected Magic Lantern slide. A very special bonding experience is shared by the viewers during such a show and I would like to perpetuate this tradition. I am not at all opposed to eventually scanning and making both sets available for world-wide viewing. 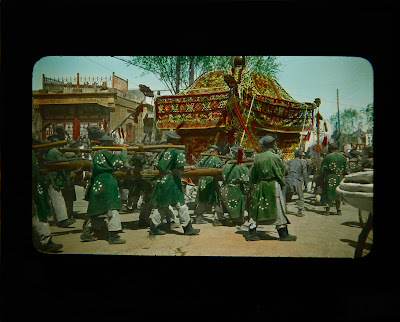 I would just like to make a Magic Lantern slides from the re-photographing trip to compliment the craftsmanship, history and tradition of the original set. 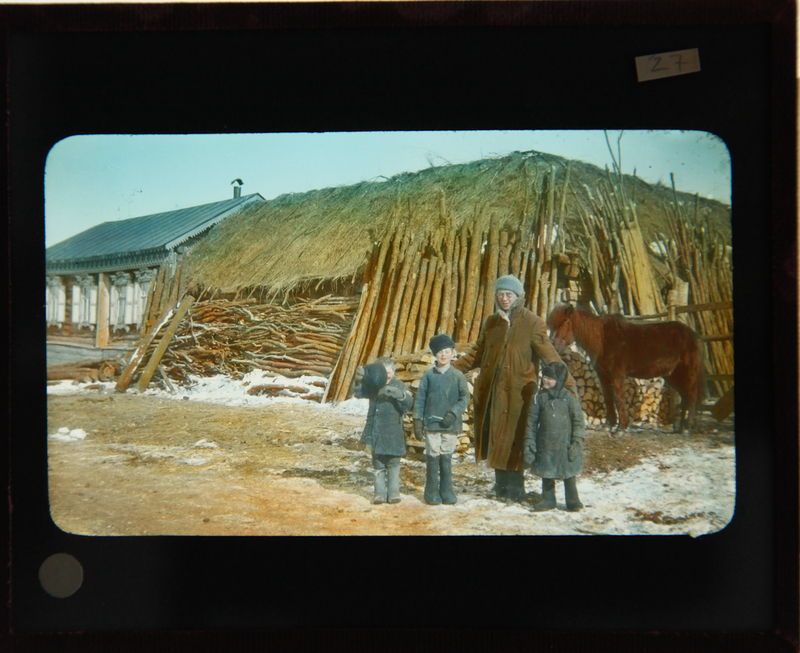 Rahill and three Russian boys in a small village. 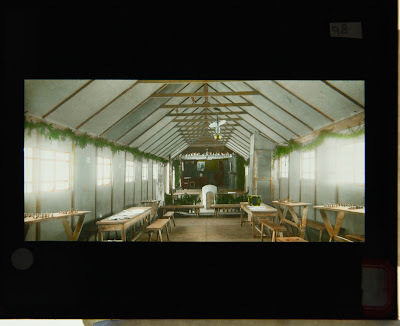 Interior of the Soldiers House that Rahill set up in Valk. Soldiers on Omsk train station platform. 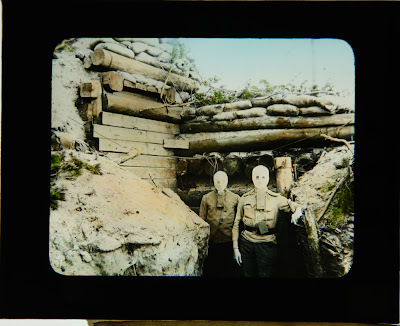 Soldiers with gas masks by bunker. YMCA members entertaining train station crowd. One of the slides purchased by Rahill in Moscow from Baranov studio. Funeral Procession in Peking, China. Japanese fishing village and inhabitants. Please send a direct email to thephotopalace@gmail.com and I will be happy to discuss publishing the collection in a book, giving Magic Lantern Slide shows featuring some of these images, or any other requests you may have. I could also make you a beautiful print for your home or office. Our educational programs and research are supported by contributions from readers like you. Please consider a donation of any amount and click the button below. 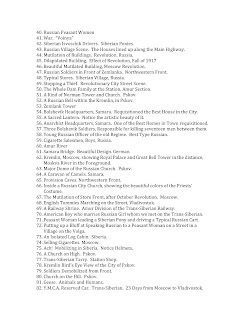 At the request of scholars who are interested in this topic and for the purposes of furthering the research in this area and promotion of this collection I am adding JPEG files with all the lecture card texts. 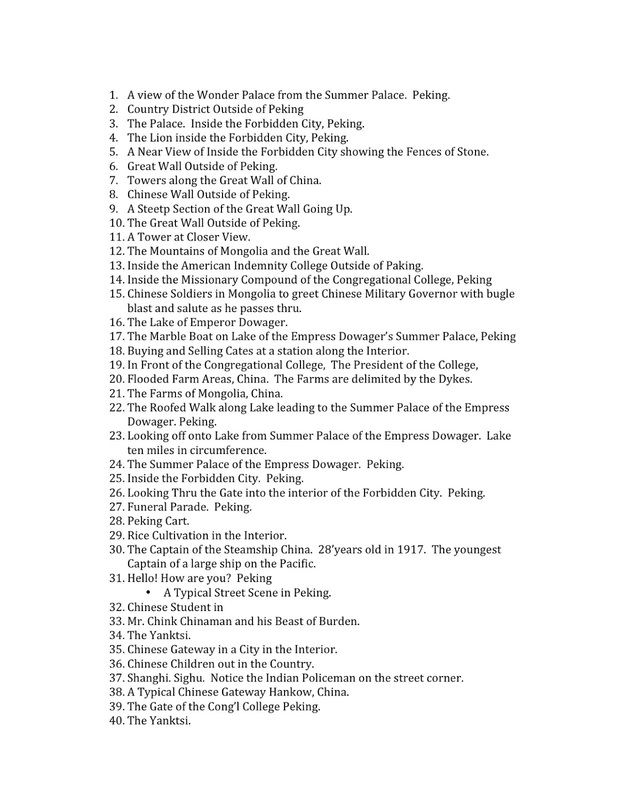 Feel free to download these and get a better idea of what is contained in this collection. consider supporting it via our Support Page or via the Donate button below. Thank you Carin for being the catalyst for all of this! 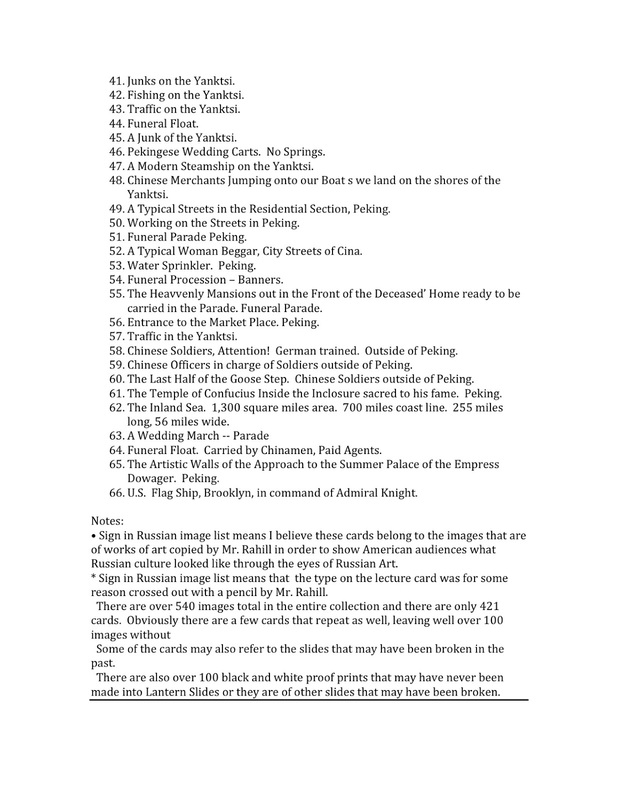 Those pictures might took from Northeast China instead of Russia/Japan. 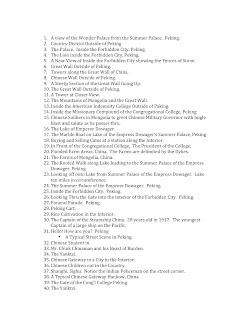 Most likely was took from Manchuria. 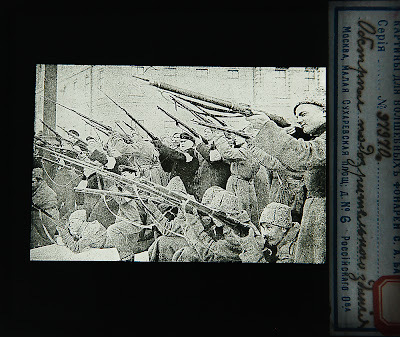 During that period of time, Manchuria was invaded by Russia and Japan. love this period of history and love to see first hand accounts and images, truly a great and rare find. "My aim is to go back to Russia in 2017 and travel along the path taken by John and re-photograph the same locations 100 years after him.". The trip taken by the original photographer, John Rahill, was taken in 1917; so 2017 would be exactly 1 century later. Such a cool idea to do this! Yep exactly, 100 years later would be such a cool round number to do a re-photographing trip on! I totally look forward to it. Parabéns pela coleção! Sou professor de História aqui no Brasil e fiquei emocionado ao ver seu relato sobre a aquisição dessa coleção de imagens! Incredible find, reminds me of the Albert Kahn collection. Good luck with your project, I hope you find a place to publish them. You should also look into the plight of Russian civilians during this war during your 2017 trip. 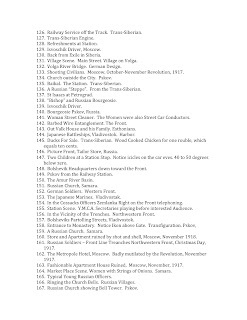 During the great famine caused by the war, many Russians fled from Russia following a very similar path from Russia, into China, from there escaping China to Japan and then whatever country would take them through the Geneva Convention. Many ended up in Australia such as my family. Of course, others tried to flee through other routes. Their stories are quite horrific. In Russia, it was death from starvation or freezing. As one person who lived through it explained "not a bird in the air or insect or animal was found on the ground." People started eating others from lack of food. 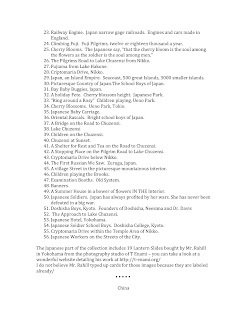 In China, their plight only continued, of those that managed to escape (many were religious, and in China...), entered Japan and from their were taken by other countries such as Australia. I would like to converse with you on this subject. Is that possible? Hello! Do you understand Russian? 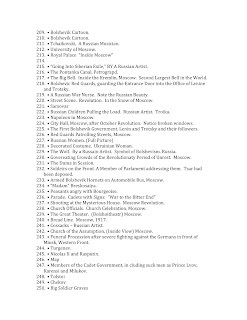 Us from the blog world photo stories (vk.com / phistory) would like to get access to the digitized collections! Amazing discovery! I love the hand coloring of the photographs. Thank you for sharing this "window in time" with us. I love seeing old photos like this and imagining what the day was like for the people in them. 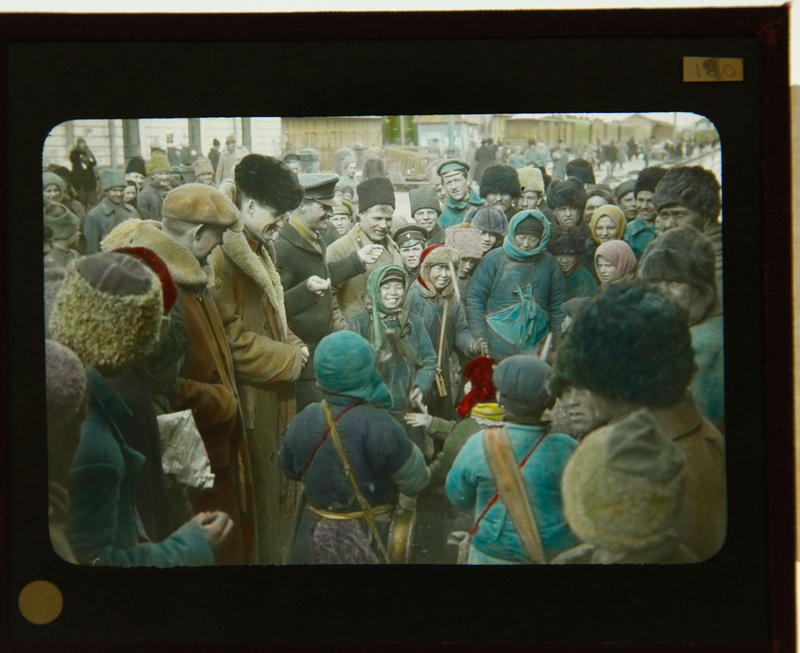 Have you checked to see if they were possibly colorized to be used in a film of the times? I am so glad you are taking on this project. Why not speak with Yale regarding it. I bet there is a grant in there for you. Perhaps a gallery at Yale would exhibit the project? Thanks for sharing and I look forward to seeing the exhibit in The near future. Fabulous idea! My cousin works at Yale and may have some "influence" in getting this accomplished. And she is fluent in Russian as well. If interested please contact me. I will do my best to establish a contact with them, thank you. This would be an excellent series on the History Channel, PBS or Discovery. I hope you find a broader platform to share the story preserved in this time capsule. Thank you so very much for your diligence and care. The photo with the women holding strings of what looks like mushrooms reminded me of the "old country" my Mom's parents come from, in Lithuania. 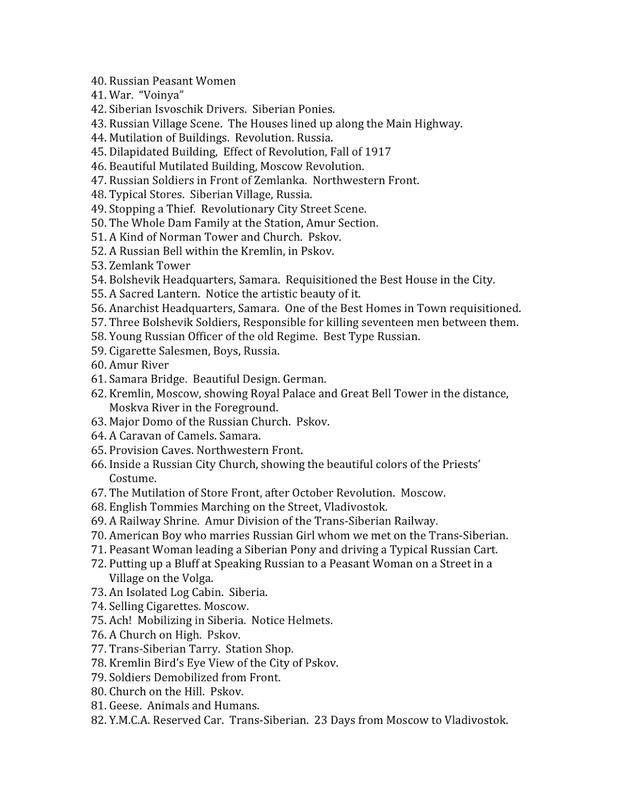 Then I read that the photographer served in the Latvia/Estonia area which is right next to Lithuania. The ladies in the photo wear "babushkas" or head kerchiefs like my grandmother used to wear. My grandmother came over on a boat as a teenage girl around the same time these photos were taken. Very moving pictures and absolute treasures. At such times I usually get a '33' sign and here it is on your bus alongside. Almost every tank and landing craft in news documentaries have '33' on them. But I get it many times a day and night, even in Roman Numerals. Most people though, including Uri Geller see 11.11 and I have come across a couple who see 17. 3 decimal is 11 binary and 7 decimal is 111 binary. In other words a computer recognises these as positives which is a way of saying 'Yes' or 'Right' or giving a pat on the back, but these photos are also Positives and not pictures printed from negatives. I came here from the article on CBS, and really enjoyed browsing these pictures. I am curious about one thing: In the slideshow on the CBS website, most of the images had a copyright notice watermarked onto them. Since these pictures are obviously in the public domain (depending on the laws specific to each country, of course), why would such a watermark be placed on them in the slideshow? Thanks again for showing us a glimpse of this collection- it's truly amazing! Muito bom e importante para a história. Glad to see people enjoying them. Really looking forward to doing Magic Lantern Slide shows using a selection of these as well. They Look fantastic projected about 10-20ft across. 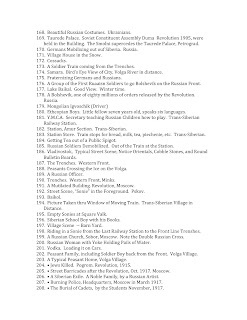 Dear Anton, I have not seen the whole collection and do not know if Mr. Rahill passed the Urals during his trip (actually, he could not avoid the Trans-Siberian on his way to China) - but if you ever decide to come to Chelyabinsk or Yekaterinburg, we can help you to locate the places where the pics were taken (if they were, of course). 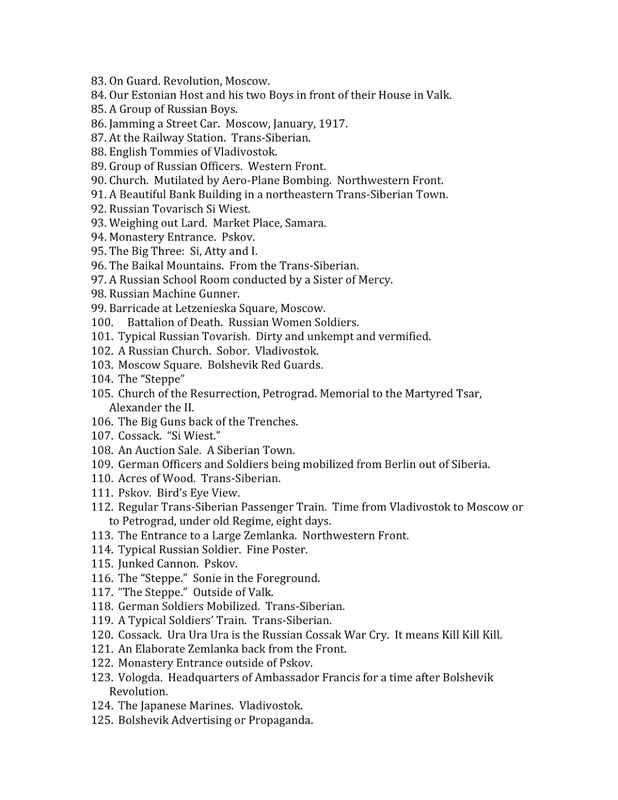 I know it for sure that in summer and fall of 1918 there were representatives of YMCA in my region. 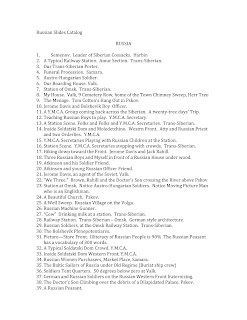 I am aware that YMCA representatives were indeed in Siberia in 1918. From what I understand they were working on the huge relocation process - both bringing the Russian troops home and assisting German POWs in getting back to Europe. I would love to learn more about it and if you know of any archives that exist there, do let me know. 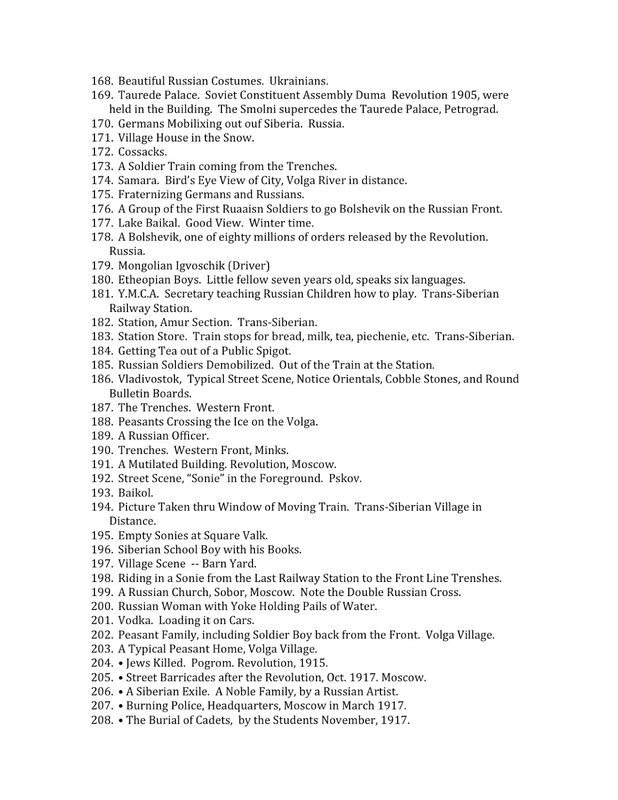 In the collection there are quite a few images of train stations along the Trans-Siberian and a few shots of Lake Baikal. There is also an image of German POW barracks and I assume that was in Siberia as well. I don't think I'll put the collection on DVD and for sale until after I find a publisher for them. Though I would love to people to see the images I would like to hang on to them in an 'unseen' condition until that time. For now I have put together a Magic Lantern Show and am going to take it on the road across US. I would love to come to Russia and put on a show with these images, but at this point I have not had any offers of that happening. And who knows... Maybe I will be able to come to Siberia in The Photo Palace Bus - are there any roads around where you live? 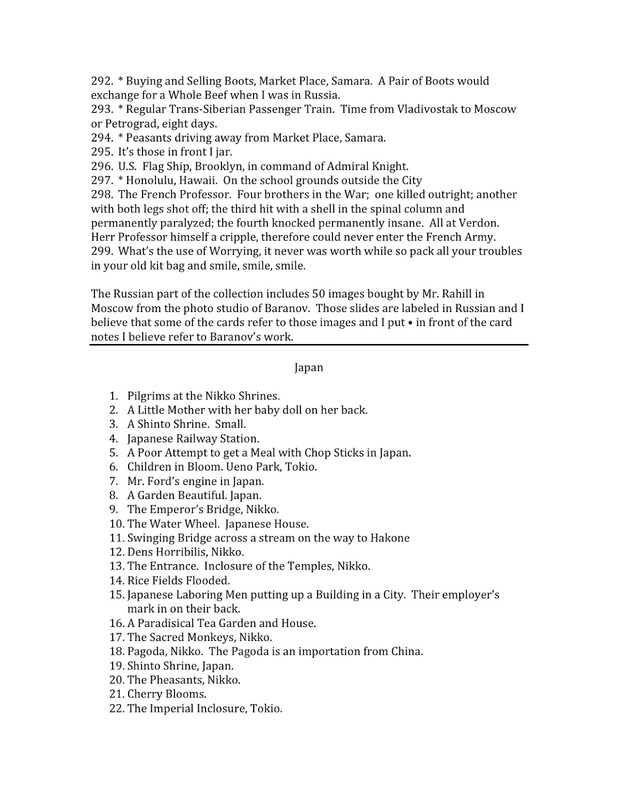 :) My plan (if I can pull together some $$$) is to go on a world tour in 2020 so I was indeed planning on being in Siberia for at least a part of that journey. Incredible shots and brilliant color! 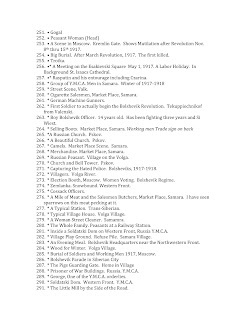 I write about the era just before the Revolution and most of the photos one finds are in black and white and very grainy. But these are gorgeous! Wishing you all the best. I think your project is fascinating. Remarkable! I have been going through my husbands families old slides and it's just amazing to see our hometown of Cleveland in the 1950's and Japan in the mid-1960's. To find slides from 1917, is just simply awesome! I wanted to know if everyone in his slides were named? If the photographer had done that it would be interesting for people researching their family history to see these photos of their family members taken from 1917! Good luck with an amazing project! Hello and thank for the comment. I'm glad you enjoyed this post. In answer to your question - unfortunately there were very few names mentioned in the lecture cards that came with the collection and the cards were separated from the original images, so it's tough to match them up with any certainty. There are probably 4-5 names in total and most of them are of other YMCA workers. I am working on identifying which images belongs with this card, but it's a pretty tough task. I am more interests in identifying the exact locations where the images were taken and going back to those places to see what's there now. I'd love to do a re-shoot 100 years later using the same camera and film as Mr. Rahill used and then make a second Magic Lantern set. I didn't notice if this was already suggested, but I am reasonably sure such an interesting project would do well on Kickstarter.com for funding. If I don't find a more legitimate source of funding I will go there. Recently kickstarter has become a place of less creativity and more gadget and other product development, which is a shame. I hope to work find a publisher for a book, until that time I'd like to keep the rest of the images a mystery. It's good to see those photos from the past. Thanks for sharing it. I will be interested to see more of these excellent photographs when you publish your book. I'm in South Korea, so I doubt that I can come to a Magic Lantern show. It sounds like a profound experience! These are extremely beautiful and amazing. I support your dream of making another matching yet different set of slides to go along with these. The contrasts must be something amazing. Exquisite is a good word for the coloring on these. Thank you for sharing them with us. I highly recommend KickStarter as a great place to raise funds for a project such as this. I would pledge! А вы не могли бы поделиться техникой сканирования. У меня есть несколько Magic Lantern, но я всё не могу к ним подступиться. Great photos, what a pity that the tehnology was not developed in Russia at that time, we could have more photos.